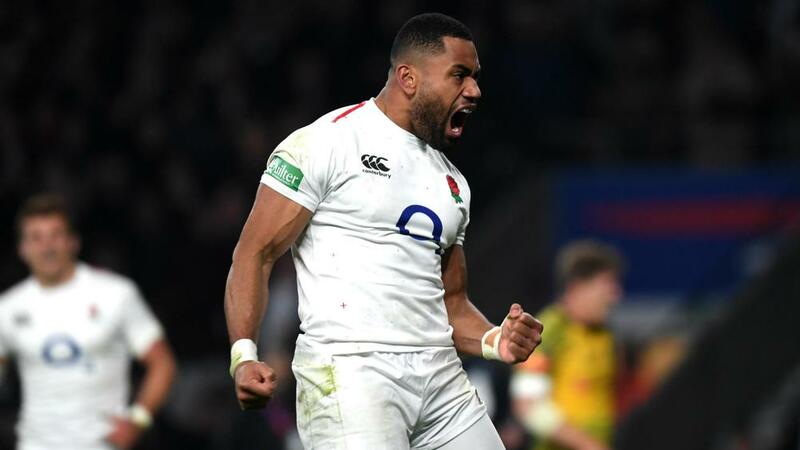 England rounded out their November series with a record sixth consecutive victory over Australia courtesy of a convincing 37-18 triumph at Twickenham. Jonny May, Elliot Day, Joe Cokanasiga - who now has two tries in two caps after a debut score against Japan last week - and Owen Farrell all touched down as Eddie Jones' men made it three wins and just one loss for the month. It might have been a different story had Australia not been denied a penalty try for an apparent shoulder charge from home captain Farrell on Izack Rodda on the stroke of half-time that would have put the away side in front. But in truth, England were good value for the win, with Sam Underhill, Kyle Sinckler and Cokanasiga particularly impressive, while Australia were dominated at the scrum throughout. Wallabies head coach Michael Cheika will now face more scrutiny of his position, with Australia recording fewer than five wins in a calendar year for the first time since 1995. England made a relentless start and were rewarded in the third minute when Mark Wilson picked up from the back of a scrum and popped to Ben Youngs, who played in May to score in the right corner. Matt Toomua kicked Australia onto the scoreboard, but Farrell nailed two three-pointers either side of a Dane Haylett-Petty try being ruled out for a forward pass by Toomua in the build-up. Australia finished the half strongly and had their try four minutes before the break. Israel Folau ran a sublime line past Farrell and side-stepped Youngs to touch down under the posts. The Wallabies were unlucky not to be awarded a penalty try for Farrell's questionable charge on Rodda just shy of the line, but a Toomua penalty levelled the score at half-time in this Cook Cup clash. England went back in front through a combination of suspect Toomua defending and a fine run from Daly, who collected Farrell's offload, outpaced Will Genia and had too much speed for a desperate Haylett-Petty. The hosts stretched their lead when Underhill did well to keep the ball alive and the play was worked left where Cokanasiga overpowered Haylett-Petty and sprinted towards the posts. Another barnstorming run almost led to a second for Cokanasiga, only for the Sale Sharks winger to be held up shy of the line, but Farrell kicked another penalty to stretch the lead to 17 points. May was denied a stunning a breakaway score when an initial kick from Henry Slade had clipped the touchline. There was more cause for celebration in the closing stages as Manu Tuilagi made a first international appearance since March 2016 and co-skipper Dylan Hartley came on for a record 56th England outing at Twickenham, before Farrell finished a fine team move for the hosts' fourth try and Folau scored a last-gasp consolation.